Wellbeing is how we feel about and experience our life. More than simply being ‘healthy’ (although it’s about that too), it is about having a real sense of happiness and balance across all aspects of our life – from physical and emotional health to our work and home life. Launched in April 2016, we – First for Wellbeing – are a new social enterprise set up entirely to improve the health and wellbeing of the people who live in Northamptonshire. By integrating a range of services, programmes and facilities across the county, we are on a mission to encourage and support people to achieve a healthy balance across all areas of their life, enabling them to live the best life they possibly can. How? By looking at each and every person exactly how they are – as an individual. By assessing someone’s needs and goals in a more holistic way, we can understand the ‘full picture’ of that person’s life and better connect and direct them to a whole selection of opportunities in their area. We do this by using our specifically-developed online wellbeing assessment tool, created for us by a team of digital specialists with input and backing from Northamptonshire County Council’s Public Health experts, Northamptonshire Healthcare NHS Foundation Trust and the University of Northampton. 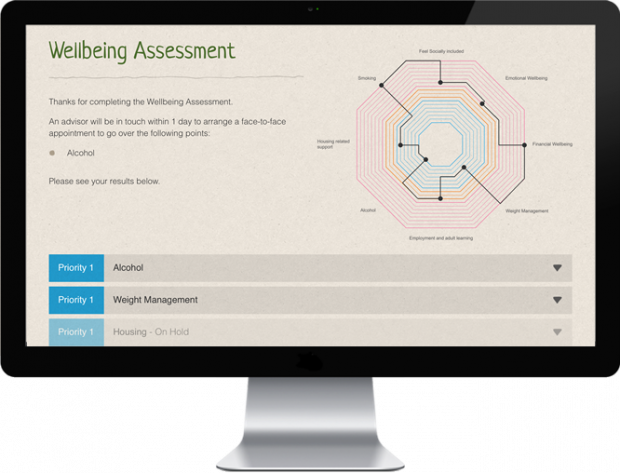 The system behind the assessment - OCTIGO - was designed and named after the eight (‘octa-’) areas of wellbeing, and is a simple, easy-to-use online tool that takes no longer than 10 minutes to complete. While all of this is predominately about preventing poor long-term health, it is also about showing people that, often, help and support is readily available to them out in the community. So, how do libraries fit in to all of this? More than simply a place to borrow and read books, libraries have transformed into vibrant community hubs. A place where people find out about – and access – community services, learn new skills and connect with others. A place that silently combats social isolation, helps people find work, facilitates community groups and connects students with the latest in research. Libraries are vibrant, multifaceted places. Each one constantly evolving and reinventing to become more relevant than ever. In Northamptonshire, we are aiming to take this up a level. Given the idea behind First for Wellbeing is to build up a true community of local wellbeing experts and services, it is only fitting that libraries take the role of our physical and spiritual ‘home’ – or 36 ‘homes’, for that matter. Libraries are now used to hold meetings, community events and adult learning courses. More often than not, our wellbeing advisors will use libraries to conduct client appointments and that all important first wellbeing assessment. Libraries allow us to operate right on the front-line of our communities – to be present, aware and engaged with the very people we are supporting and connecting with. By using libraries in a number of ways with a range of people, we are hoping to start to get people to think differently about their local library, to use them in every way possible to help improve their overall wellbeing. The future for libraries is looking more vibrant and ambitious than ever and I, for one, cannot wait to see how far we can take it. Northamptonshire libraries are delivered by First for Wellbeing, a Community Interest Company, on behalf of Northamptonshire County Council. For more information on First for Wellbeing, including all services on offer, visit www.firstforwellbeing.co.uk, email info@firstforwellbeing.co.uk or phone 0300 126 5000.